Here at last ! The eagerly awaited and much talked about Express-Chem Hydrovator. 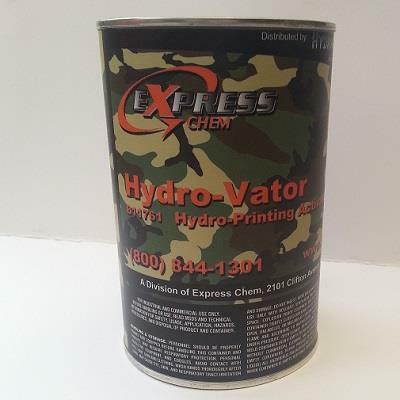 See for yourself why this activator has taken the American Hydrographics Industry by Storm. Tames the most of awkward of films giving great dips and superb colour retention. Don't be fooled by the lower price, this really is a great all rounder and the price reflects Express-Chem's standing in the Industry. Made in bulk to satisfy the Huge American appetite for this activator means we can buy it cheaper and pass the savings onto customers. Contains the SVHC 2-Ethoxyethyl acetate . Prolonged exposure without the correct PPE can effect the reproductive system. PPE including coveralls, gloves, eye protection and a respirator should be worn when using and handling all Hydrographic activators regardless of brand inline with datasheet recommendations and the guidelines set out by the HSE for handling paints, activators and chemical solvents in the workplace.